All participants receives presentation file automatically. You can automatically create mind map presentation from MS Word, MS PowerPoint, MS Project files, or many mindmapping formats using ConceptDraw MINDMAP input capabilities. ConceptDraw MINDMAP is a cross-platform application works on both Mac and PC. 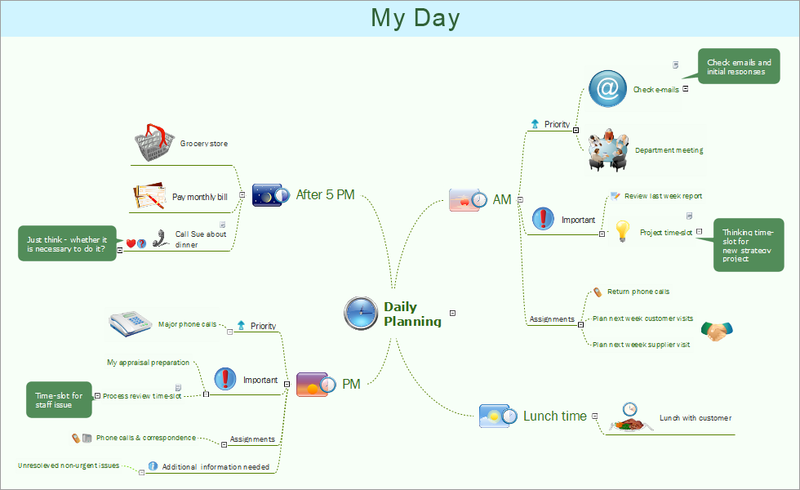 Daily planning mind map sample is created using ConceptDraw MINDMAP mind mapping software. This mind map example helps to learn how to send and show mindmap presentation on Mac via Skype. Use this mindmap example for implementation of solution Remote Presentation for Skype from ConceptDraw Solution Park.